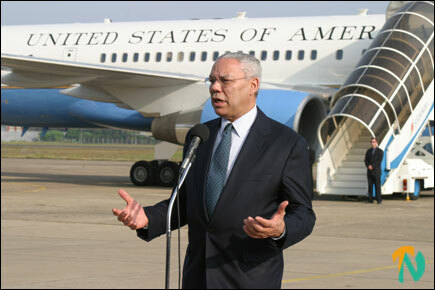 Pledging USD 25 million for immediate relief and reconstruction of Sri Lanka, US Secretaryof State Colin Powell said in a press briefing held at the runway at the Katunayake Air Force Base, Colombo, that US military presence will not affect the ongoing peace process. Responding to a question about how long the US military would stay, he said they would remain long as it is required by the Sri lankan government and would ensure that the reconstruction and rehabilitation work is complete. Mr Powell toured tsunami ravaged Southern harbour city Galle where US marines are stationed and was on his way to Nairobi when he talked to the reporters for 10 minutes at 4.45 pm. Of the 25 million $4m will be used for immediate humanitarian needs and a further $10m will be utilized for temporary housing. US has promised similar amounts for twelve other countries, Mr Powell said. Mr Powell did not elaborate on how the US troops would be employed in rehabilitation and humanitarian work. 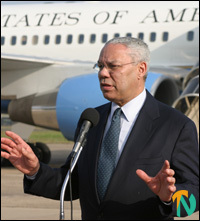 Mr Powell said that the U.S received request for help from Sri Lanka's President and Foreign Minister within 48 hours of the disaster. He added that U.S will continue to assess the situation throughout the tsunami affected region and react appropriately. Question: How do you see the relief effort developing? Mr. Powell: We are going to provide support working with the international community. American USAID personnel are hard at work delivering food assistance, medical assistance, providing shelter. We are going to do more. 4 million dollars of goods are being distributed now another 10 million dollars is going to be spent on employment program that will employ Sri Lankans in the clean up and reconstruction effort and start the economy going again in those parts of the country that were hit hardest. Another 10 million dollars will be going to Sri Lanka for the purpose of constructing temporary housing in order to getting people out of from under plastic sheeting into temporary housing until such time as permanent housing can be made available. Total US contribution is roughly 25 million dollars or so and I expect it will go up in the days ahead as we get a better understanding of the needs of the Sri Lankan people. The President and I also talked about the program called the millennium challenge account which is a new initiative of president Bush where we help developing nations that are committed to democracy build their infrastructure. The international community has mobilized in a way that I have never seen before to help the effected people to rebuild their houses, school sand business and above all rebuild their lives. We will be here for a long period of time by the simple fact that our embassies are here our USAID missions are here, US military forces are in the region. I can’t tell you how long they will stay, there are other missions that have to be performed in due course. Our marines will be arriving in greater strength tomorrow. We expect engineering unit and some medical personnel will be coming ashore in a next couple of days. But I cannot tell you how long those units will be here. But in terms of recovery effort the principle agent responsible for the recovery effort is the Sri Lankan government and as long as it takes them to restore infrastructure and reconstruct their society the United States will be here with them. But the numbers will vary in accordance with the need. Question: Did you have any contacts with the LTTE? Mr. Powell: I haven't had any contacts with them. The reports I receive from the government suggest that aid is going into the northern part of the country, those parts of the country that are under their control. The government believes that the Tamil regions are getting much or more as their proportion and you’ll have to wait and measure that over time. But I know that aid is going there but I had no conversation with any of the members of the LTTE. Marines for the most part I think will be, I don’t have the details of their plan, but will be working for the most part in the southern part of the country. They will go to other parts of the country for medial purposes and up to the north to restore capacities of one of the hospitals. And I will leave to the military commander to make judgments as to how best to deploy the forces that he will have available to him. Question: What do you think the US role will be in Sri Lanka's Peace Process? Mr. Powell: As you know we have always tried to pay a helpful role working with our Norwegian colleagues. My deputy secretary Mr. Armitage has been deeply involved in the process. I don’t think our military presence in anyway shapes or affects political situation. Ultimately the problem has to be solved between the parties concerned. United States military presence is strictly for humanitarian purposes and not in any way to influence political outcome one way or the other. We are hopeful however that if all Sri Lankans come together to deal with this common catastrophe, this common crisis, and work with each other and cooperate with each other and cooperate with each, then perhaps that spirit of cooperation can be elevated and extended into the political dialogue and find a way forward to a political solution to this long standing crisis between government and the LTTE.